More organizations—including Nike, Ben & Jerry’s, Patagonia and Airbnb—are taking a stand on hot-button issues, which can positively affect bottom lines. Though once seen as a risky decision to avoid, a recent Clutch survey revealed that organizations’ values are becoming more important to consumers in the U.S., which can affect both sales and consumer loyalty. The survey reported that 71 percent of consumers say it’s important for organizations to take a stance on social issues and current movements, and 75 percent say they’ll start shopping at a company supporting an issue with which they agree. “As recently as a few decades ago, a general PR rule-of-thumb for companies was to avoid voicing opinions on controversial topics and social issues. Now, however, companies are expected to speak up,” Clutch wrote. Consumers looking for organizations to make a difference is a growing trend, too. Sprout Social’s 2018 Championing Change in the Age of Social Media report revealed that 66 percent of consumers call for organizations to take a stance on current issues—with more than half (58 percent) supporting that stance actively spread via social media platforms. In their 2018 Purpose Study, Cone and Porter Novelli reported that 78 percent of U.S. consumers say organizations must positively affect society, not just make money—and nearly the same amount (77 percent) say they feel more emotionally connected to organizations driven by a purpose and values. Companies with values that align with those of their customers create a sense of community and solidarity around their brand. “When a company shares their consumers’ views and values and helps contribute to solving a problem everyone agrees is a problem, consumers are going to want to keep working with or buying from that company,” said Josh Weiss, CEO of 10 to 1 Public Relations, a PR firm in Scottsdale, Arizona. Taking a stance on a hot-button social or political issue might seem risky to PR pros, but remaining silent can also negatively effect an organization’s bottom line. Cone and Porter Novelli also reported that two-thirds of consumers will jump ship from one product to another, if that new product comes from an organization with a strong purpose or social stance. More than two-thirds (68 percent) will share that organization’s content across social media, further building brand awareness and buzz. Clutch’s study reported that 59 percent of people will probably stop shopping at a company that doesn’t support an issue that they find important. This consumer behavior can be explained by the Balance Theory, which states that people, businesses, and values share a series of relationships. If a business shares the same values as a consumer, the consumer will likely view the business more positively. Conversely, if a business supports values that go against those of a consumer, the consumer will likely view the business more negatively, even if he or she liked the business before. For many, corporate social responsibility efforts and organizations’ values also outweigh products’ and services’ prices. Clutch reported that 71 percent list environmentally-friendly business practices as crucial to their loyalty. 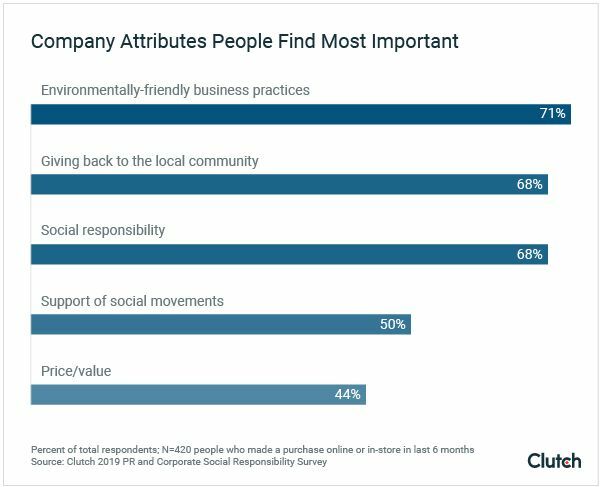 Efforts to give back to the community where an organization resides and specific corporate social responsibility initiatives come next, with 68 percent of consumers listening these attributes as important. Half of consumers said an organization supporting a social movement is important, whereas only 44 percent listed price or value as an important factor to purchasing decisions. Consumers might pay more for products and services from organizations that align with their values, too. The study, Supply Chain Visibility and Social Responsibility: Investigating Consumers’ Behaviors and Motives, identified a strong preference among at least 70% of consumers for advertisements with more precise information about corporate social responsibility (CSR) activities compared to ones with vague information if the price did not change. And while not all participants were willing to pay more, study participants on average were willing to pay about 2% to 10% more for products presented with accompanying precise CSR information, depending on the type of activity and the industry of the corporation. A 2017 Cone Communications CSR study reported that 87 percent of consumers will purchase a product or service if that organization advocates for a cause they care about. Conversely, 76 percent will not buy from organizations that support issues that don’t align with consumers’ views. Organizations’ values are more important to younger demographics, as well. Clutch’s study reported that 70 percent of consumers ages 35 to 54 and 54 percent of consumers ages 18 to 34 will boycott an organization that supports an issue with which they disagree. However, only 37 percent of consumers ages 55 and above will stop shopping at organizations that don’t match their beliefs.